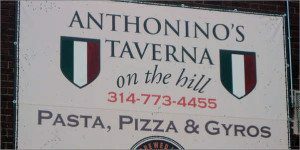 Anthonino’s Taverna – featured on Diners, Drive-In’s and Dives – 2012, located on The Hill at 2225 Macklind Avenue, St. Louis, MO 63110– Phone (314) 773-4455. Their biggest accomplishment is being featured on the popular Food Network show, Diners, Drive-In’s and Dives in 2012. The show has assured their destiny to even further heights of success. You can’t get any better advertising than by having Guy Fieri visit and film his show, Diners, Drive-In’s and Dives at your restaurant establishment. When that happens, you know your doing things right. We want to thank Anthony for taking the time to meet with us. We hope our review helps to attract attention to their fine establishment, not that we can compete with Guy Fieri, but we hope it helps nonetheless. 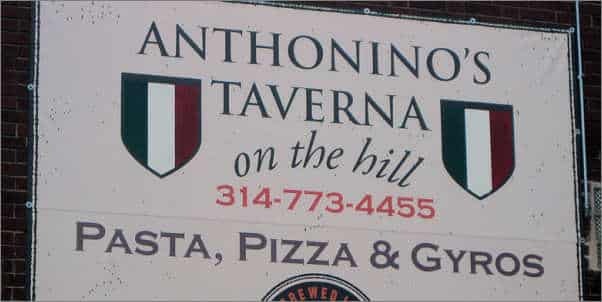 We RECOMMEND Anthoninos Taverna and congratulate Anthony, Rosario, family and staff on creating and maintaining such a unique establishment that is truly an asset to the community and city. St. Louis Restaurant Review writes and publishes the reviews at it’s own expense and is not paid by the restaurants for reviews. Our objective is to offer independent, unbiased reviews.